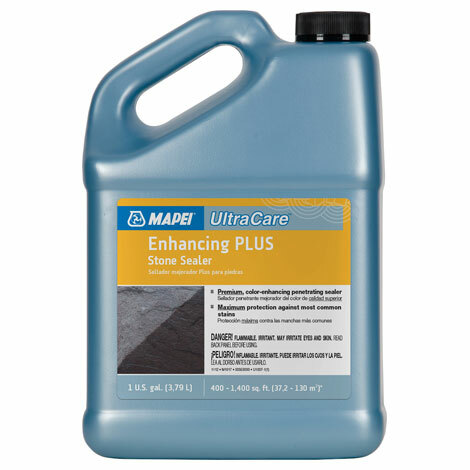 Mapei UltraCare Enhancing Plus Stone Sealer is a premium, color-enhancing penetrating sealer that enhances the natural colors of stone and provides maximum protection against most common stains. It is safe for use on all interior and exterior naturalstone surfaces, such as marble, limestone, sandstone, slate, granite, travertine and cementitious grout. The product can also be used as a pre-grouting sealer. Note: If UltraCare Enhancing Plus Stone Sealer is not wiped completely dry within 5 minutes, a surface residue may occur. • Ensure that product does not come in contact with any non-recommended surface. • Do not use on glazed tile or nonporous surfaces. • Surface must be dry and free of contaminants, including previously applied sealers, dirt, lime and hard-water deposits, rust, and other heavy soil and grime. • Allow new grout installations to cure for at least 48 hours before application. • Sealer may be applied to surfaces that have been dry for 24 to 72 hours. • Surface and sealer temperatures should be between 50°F and 80°F (10°C and 26°C). • Ensure that the area is well-ventilated during application and until the surface is dry.